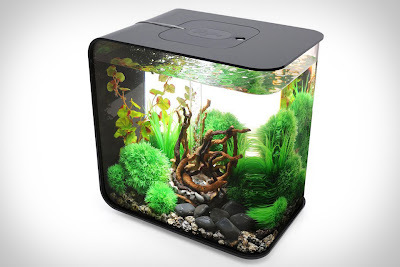 This self-contained "Flow Aquarium" from Biorb is petite enough for a desktop (under 15 inches square) and operates with a low power wattage (12 volts). Just add your own living things and enjoy the view through structurally-sound acrylic sides. Via uncrate.com. If you're interested in planted aquariums check out plantedtank.net, it's a great place to start. Thanks for that comment, robotguy! That is a beautiful tank and a wonderful resource! The reviews for the biorb flow aquarium sound pretty weak. You have the neatest things! This aquarium is so cool.